Through relating correctly we have achieved peace. Maintaining peace requires inner discipline. Interpretation: Share good fortune with others. Peace after difficult times. Be flexible but true to yourself. A time of peace, prosperity and good fortune. Compared with all other hexagrams, this one is completely balanced. Through relating correctly we have attained peace. Maintaining peace, however, requires that we remain firm inner discipline. (see below for a Tibetan Buddhist perspective on how one may cultivate a firm inner-discipline). 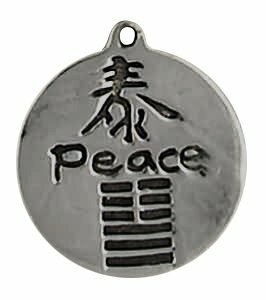 This hexagram comes to affirm one has attained an inner equilibrium, through perseverance of right behaviors and good attitude. The counsel here is to not folly when times are good, rather continue the good practices that got you here. Do not waste this valuable time! One of the dangers of peaceful times is our tendency to become complacent and reliant on good times. Efforts made to maintain status quo, means that we become conditioned and thus unable to react with innocence when times are difficult. The best advice to follow is to continue the behavior and attitude that got you to this position of balance and inner peace during this “peaceful” period and beyond. It is human nature to celebrate after a time of great difficulty. What the sage advises is to share your inner wisdom gained from this trying experience and continue to build upon this good virtue with continued practice. For me the continued practice is daily meditation and resolute resolve to act with humility, integrity and compassion with each and every person and situation that manifests. In giving an overview of the Buddhadharma, as practiced by the Tibetans, I generally point out that the Buddhism we practice is an integrated form comprising teachings of the low, bodhisattva and tantric vehicles, including such paths as the Great Seal. Because quite a number of people have already received initiations, teachings and so on, they might find it helpful to have an explanation of the complete framework. We pass our lives very busily. Whether we behave well or not, time never waits for us, but goes on forever changing. In addition, our own lives continually move on, so if something goes wrong, we cannot repeat it. Life is always running out. Therefore, it is very important to examine our mental attitude. We also constantly need to examine ourselves in day to day life, which is very helpful to give ourselves guidelines. If we live each day with mindfulness and alertness, we can keep a check on our motivation and behavior. We can improve and transform ourselves. Although I haven’t changed or improved myself much, I have a continuing wish to do so. And in my own daily life, I find it very helpful to keep a check on my own motivation from morning until night. During these teachings, what I will be describing is essentially a kind of instrument with which to improve yourself. Just as you might take your brain to a laboratory to examine your mental functions more deeply, so that you can reshape them in a more positive way. Trying to change yourself for the better is the point of view a Buddhist practitioner should adopt. In Buddhist writings many different systems of belief and tradition are explained. These are referred to as vehicles, the vehicles of divine beings and human beings and the low vehicle (Hinayana), the great vehicle (Mahayana), and the vehicle of Tantra. The vehicles of human and divine beings here refer to the system which outlines the methods and techniques for bringing about a betterment within this life or attaining a favorable rebirth in the future as a human or god. Such a system highlights the importance of maintaining good behavior. By performing good deeds and refraining from negative actions we can lead righteous lives and be able to maintain a favorable rebirth in the future. The Buddha also spoke of another category of vehicle, the Brahma vehicle, which comprises techniques of meditation by which a person withdraws his or her attention from external objects and draws the mind within, trying to cultivate single-pointed concentration. Through such techniques one is able to attain the highest form of life possible within cyclic existence. From a Buddhist point of view, because these various systems bring great benefit to many living beings, they are all worthy of respect. Yet, these systems do not provide any method for achieving liberation, that is, freedom from suffering and the cycle of existence. Methods for achieving such a state of liberation enable us to overcome ignorance, which is the root cause of our spinning in the cycle existence. And the system containing methods for obtaining freedom from this cycle existence is referred to as the Hearer’s or Solitary Realizer’s vehicle.